January 2017, GreenCandy: Deliciously Healthy Living – Welcome Butter Beans! March 1, 2012 Butter Beans Food & Garden Summer Camp 2012 mentioned in the New York Times Diner’s Journal by Glenn Collins. February 28, 2012 Butter Beans Food & Garden Summer Camp 2012 highlighted in Manhattan User’s Guide newsletter and services section. It’s not easy for a small business to distinguish itself from a much larger competitor, but that doesn’t mean you should go down without a fight. One entrepreneur quickly learned there is a way to steer customers away from bigger companies. In order to do that, she needed to make a good impression from the start. Ask a city-bred kid for their image of a farmer, and they will most probable conjure up Old MacDonald, says Felicia Desrosiers, co-founder of Butter Beans, a company that provides seasonal and locally sourced nutritious lunches to schools. But at Butter Beans’ two-week Food and Garden Summer Camp August 1 through 15, Desrosiers aims to dispel that notion by introducing 7- to 12-year-olds to the varied guises of modern urban farming through educational visits to local farmers’ markets and rooftop farms and visits with bee-keepers and chocolate-makers. Desrosiers, a certified holistic health counselor from the Institute for Integrative Nutrition who also manages a holistic health and nutrition counseling practice, is enthusiastic that her food camp “gets children engaged with their food and where it comes from.” A day camp for budding educated foodies, in other words, the Food and Garden summer camp aims “to inspire the next generation of Alice Waters, Jamie Olivers and Michelle Obamas,” says Desrosiers, through hands-on exposure. The first week of the session is focused around the growing cycle: Campers learn about composting at the Lower East Side Ecology Center in the community garden on East 7th Street; chicken-rearing at The Brooklyn Grange, a rooftop farm in Queens; planting and harvesting vegetables at Eagle Street Rooftop Farm in Brooklyn, and the pollination process with bee keepers from the NYC Beekeeping Association. In July sessions, says Desrosiers, the kids gamely donned bee suits and got up close to the hives, then sampled different varieties of honey. The second week delves into sustainable production practices with visits to Murray’s Cheese caves, a tour of Mast Brothers Chocolate in Brooklyn, and a visit with The Compass Green Truck, a moving garden truck that runs on vegetable oil and teaches youngsters about the sustainable mobile greenhouse. The next Butter Beans session runs from August 1 through 15. Classes run from 9 a.m. to 4 p.m. with drop off and pickup at the Lafayette Avenue Presbyterian Church at 85 South Oxford Street in Fort Greene. (Early and after care is available, as is a Manhattan drop off and pick up.) The cost is $115 per day and includes daily lunch, snack, camp t-shirt, transportation during the day and materials, and Butter Beans is currently offering a 25 percent discount. Sign up here, check out their blog, and feel free to email Felicia@ButterBeansKitchen.com for more details or call 718.499.0010 for details. We at Butter Beans are excited to announce a fantastic seed to table experience for kids ages 7-12! Our Food & Garden Summer Camp takes kids through our food chain system with daily visits to urban gardens, rooftop farms, parks and green markets. 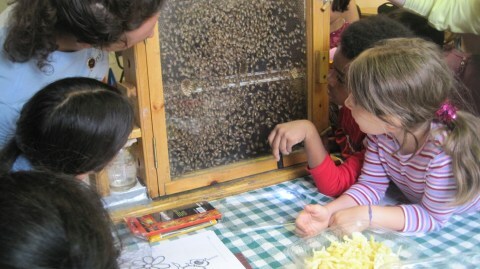 Kids connect with sustainable merchants and farmers, master composters, local chocolate makers and beekeepers. They buy local food, cook a delicious lunch (honing their chopping and cooking skills), make pickles, jams, ice cream and more- all while enjoying the best of summer outside. When: July + August 2011. Camp sessions run daily from 9:00 am to 4:00 pm. Early 8:00am-9:00am and after-care 4:00pm to 5:00pm, is available upon request. Cost per session breaks down to $115/day and includes daily lunch, snack, camp t- shirt, transportation, and all materials. Where: Base camp is in Fort Greene/Boerum Hill, Brooklyn, NY (Manhattan drop-off point available). Campers travel daily to parks, rooftop farms, and farmers markets. See our website for details and call 718.208.4051 to reserve your spot. During the school year, Butter Beans offers age-appropriate lunch programs for lower, middle and high schools using the freshest, most local and seasonal food possible. In collaboration with the schools’ administrators and students, we create delicious meals with whole grains, legumes, and veggies, healthy fats, and naturally raised meat and poultry. Additionally, Butter Beans meals are balanced with fun health facts in the cafeteria to help students learn how food is good for their bodies and brains. Butter Beans Food & Garden Summer Camp grew out of the success of our cooking classes and our 2011 Spring Break Food & Garden Camp. We at Butter Beans believe that this generation of kids will play an essential role in reconnecting our country with its food and the culture behind it. Kids are our future farmers, food policy makers, chefs, community leaders, and home dinner makers. Food and farming can be incredibly fun and exciting for kids, and can help them make better, more informed and more adventurous food choices going forward into adulthood. Seeing firsthand the work that goes into growing the carrot they eat, or how much effort goes into composting and nourishing the soil to grow the apples or pears that they love, will help them better connect with the food on their plates. In our Food & Garden Summer Camp, students have fun learning through experience about the food chain. Kids see and appreciate how much better things taste when them make them themselves and know exactly what is put into them. We can change the future of food in America with our kids, and have a great time doing so. We hope you will join us. NYU Stern School of Business and the Berkley Center for Entrepreneurial Studies awarded Butter Beans, Inc. the top prize in the 2009 annual Business plan competition. BusinessWeek article features Belinda Di Giambattista of Butter Beans. New York Family Magazine looks to Butter Beans Felicia Desrosiers, Director of Wellness, for back to school lunch tips. FoxBusinessLive Web Show interviewed Belinda Di Giambattista on their live web show.